Mother’s Day might be celebrated only once a year, but being a mother is an everyday, every minute occupation. Rashi, the brilliant 11th-century sage, offered a moving interpretation: “A mother is a woman who gives life,” he wrote (see Rashi, Genesis 3:20). Since most moms are so busy taking care of everyone else, this special day is an opportunity to give back to this wonderful person, if you’re lucky enough to have her still in your life. Here are a few ideas on how to celebrate. If you live in the Metro Vancouver area, check out the new tea service at the H Tasting Lounge at the Westin Bayshore in Coal Harbour (westinbayshore.com/htasting-lounge). It has two choices, Eastern-style and Western. Their Western Tea includes smoked salmon and cucumber tea sandwiches, as well as a variety of sweet samplings such as scones with jam and cream. Meanwhile, the Eastern Tea, while also a classic tea service, includes a mix of traditional Asian foods, such as a duck wrap. If you would rather create something unique at home, try using Yonanas (yonanas.com). My mom and I made a healthy dairy-free dessert, as the machine transforms frozen fruit into what tastes like ice cream – without all the calories. They include a recipe book with the machine, but we found it fun to experiment. We added, for example, a little chocolate and cinnamon to the frozen bananas. Mother’s Day is a great opportunity to get to know your mom better in myriad ways and a DNA test is a great way to learn about your family. We used the Living DNA test (livingdna.com), but there are others. My mom swabbed the inside of her mouth and, within a few weeks, we discovered that some of our ancestors were Dutch, Finnish and Swedish! Living DNA does a comprehensive analysis. It provided data on our ancestry throughout human history, as well as percentages of our ethnic backgrounds from 80 global regions. The company also offers a full-colour coffee table book of your results, which preserves your family history for future generations. The purse can be paired with a fancy hat. I love creating new fashions, and spending quality time with my mom doing something creative is always a joy. 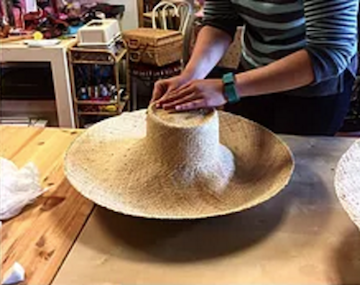 To design and make your own hat, check out Vancouver-based West Coast Hatters (westcoasthatters.com), which specializes in creating hats for film and hosts one-on-one workshops or small classes for people who want to create their own special style. In the fascinator-making class, students use a straw base and build up from there. However, if you want to get serious about hat-making, try the two-day class, where you will create a masterpiece by hand, blocking, steaming and draping the fabric into your own special creation. A personal favourite is to treat my mom to a spa day. The truth is I have yet to meet a mom would couldn’t use some time for herself, and what better way to celebrate each other than by spending quality time together in a quiet setting. There is also the option of a do-it-yourself spa day. You can set the mood by lighting candles and putting out comfortable chairs while you and your mom give yourselves facials. Personally, I like American spa owner David J. Witchell’s eponymous collection (davidjwitchell.com), which features an all-natural line of products. I like DJW’s Matcha Wash with grit for cleansing, using a towel or natural sea sponge, then following it with the company’s Shaman oil blend, which firms and illuminates the tone and texture of the skin, and its Time Traveler, which brightens, hydrates and protects your skin. To complete the spa experience, you can gift your mom some luxury body soaps. One brand I use it Costa d’Oro (siegebrands.com/naturalsoaps). Its soaps are natural, made in Arizona and leave my body feeling a decade younger. I especially like Himalayan Salt Scrub with Activated Charcoal; Lemongrass and Rosemary; and Gardenia. The best part of a do-it-yourself spa day is that your mom can use the products again and again.